When you travel, few things can bring about better experiences than setting off by foot to explore, especially at local fresh morning markets. After an hour or so of navigating the narrow, and always busy lanes of one of the neighborhood markets in Saigon, my wife and I took a wrong turn down and alley. It was down that wrong turn that led us to a stall for breakfast, and to try yet another Vietnamese noodle soup, this time a dish called bun moc (bún mọc). With a friendly lady like this, how could you not stop for breakfast? We were just exploring the market, and on our way somewhere else, when we made a wrong turn down an alley in Saigon. Down that alley, there was a lady who yellow out “hello” to us and invited us to eat, in the friendly Saigon kind of way. Having nothing on our agenda for the day but food and exploration, we decided to sit down for breakfast. 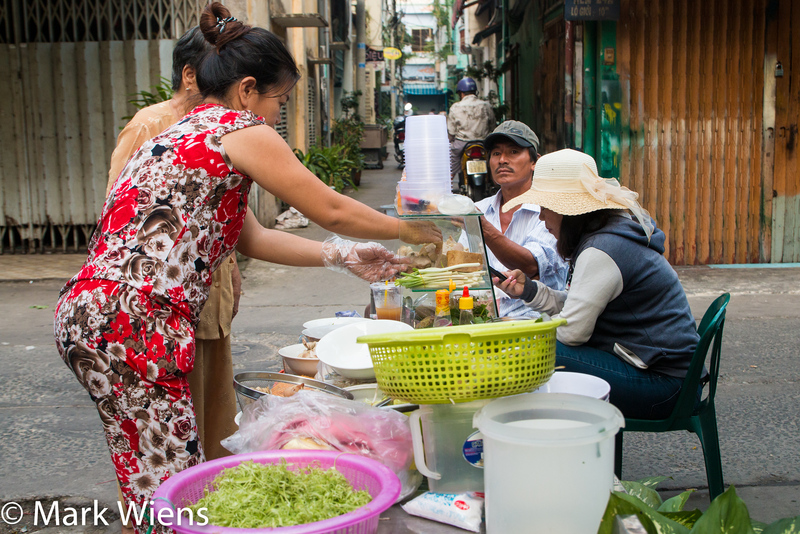 From the sign displayed on her street food stall, it was pretty clear she was serving a dish called bun moc, and we ordered two bowls. 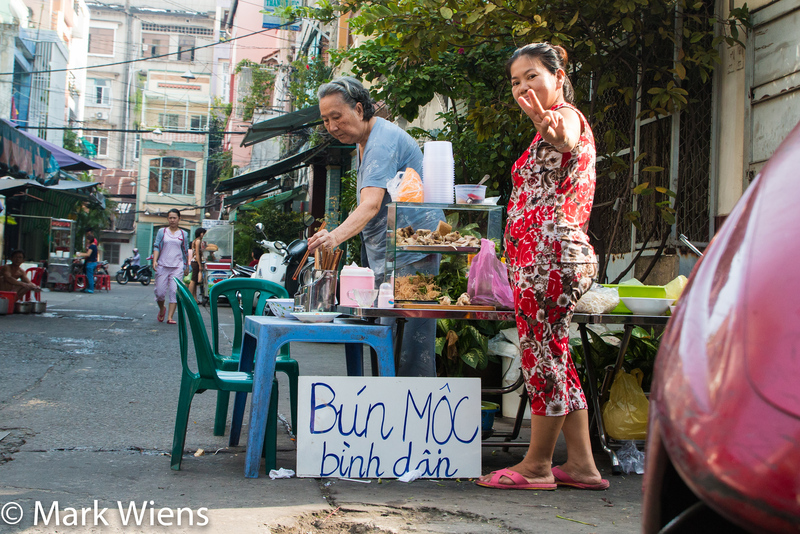 The bun moc food stall was just off the main road, and in the inersection of an alley, a very common scenario you’ll see when exploring the neighborhoods and street food of the city. There were about five plastic tables and stools set out down one of the quiet alleys, tucked away so it was a peaceful and relaxing environment, still shaded by the low morning sun. You could also choose to get front row, bar counter, seats as well. 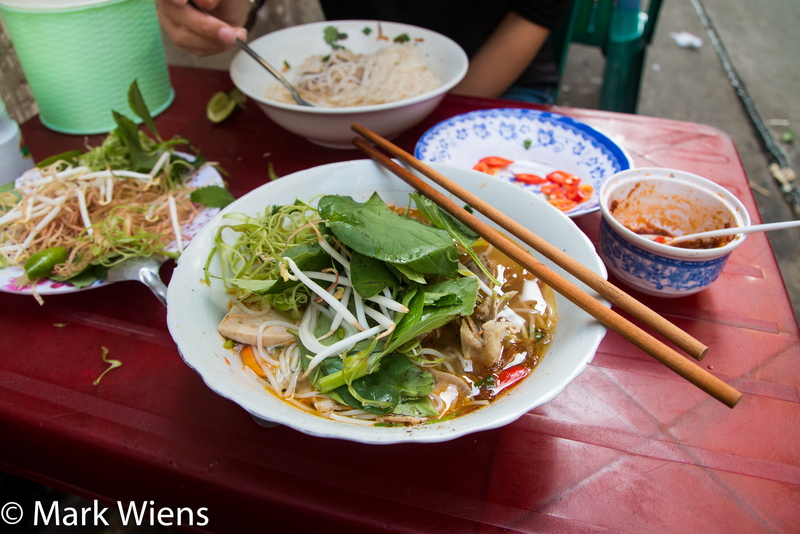 As soon as we ordered, she first grabbed a handful of bun, which are soft Vietnamese rice noodles, and piled them into the base of the bowl. Next, she tossed in a handful of coarsely chopped cilantro, some crispy shallots, and some kind of a red looking oily chili sauce, but just a touch. She then reached into the glass cabinet, which was filled with all sorts of assorted pig parts, which were pre-cooked and ready to be served, and carefully selected a range of items, including a big hunk of pig bone and added that to the bowl. The final step of putting together the bowl of bun moc was to go to the giant pot of simmering murky broth, which included some huge bones within it, and ladle out a scoop of the broth and carefully pour it into the side of the bowl, making sure not to drown out the ingredients, yet ensuring the soup trickled down through the noodles and lightly blanched the cilantro. She finished the bowl of bun moc off with another handful of crispy shallots, and a generous dash of ground black pepper, before whizzing it off to our table. This whole process I just described in the last 5 paragraphs took about 20 seconds for her to actually do, maybe less. 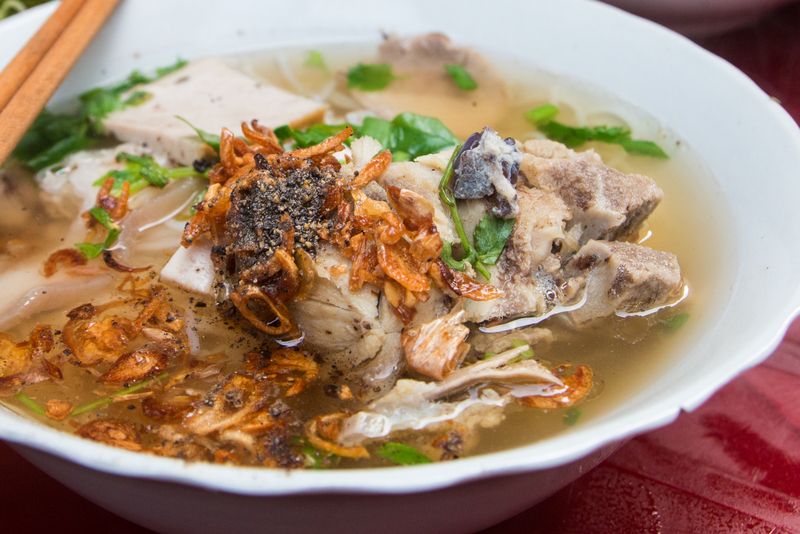 Bun moc (bún mọc), if you compared it to other Vietnamese noodle dishes like the crab flavored bun rieu or the fermented fish flavored bun mam, is quite a plain tasting noodle soup. The broth is not that far away from a clear meat based broth you’d find in a soup like pho, but with bun moc, to me it tasted even more simple, with less of a cinnamon sweetness spice to it. The main key ingredient used in the broth of bun moc are shiitake mushrooms, which are boiled in the soup along with the pork, to give it a slightly earthy mushroomy flavor. Once the broth is made, the rice vermicelli noodles are combined with pepper and cilantro, pieces of the pork, and finally, what I really liked about it, a good couple handfuls of deep fried crispy shallots. How was the bun moc? Our bowls of bun moc came piping hot, and were delivered with a smile. I’m always a guy who adds all extra flavor enhancing condiments to my noodles or other dishes. But in order to taste the flavor right out of the pot, I decided to taste test before garnishing with anything. The broth did have a light noticeable mushroom flavor, sort of like cream of mushrooms soup, without the cream. From there, it had just a pleasant, but not overpowering flavor of pork, with a hint of black pepper, and an oniony fragrance from the shallots. Along with big pieces of pork, there were also a few pieces of Vietnamese sausage, similar perhaps to the pieces of sausage served in that amazing op la eggs skillet and baguette. 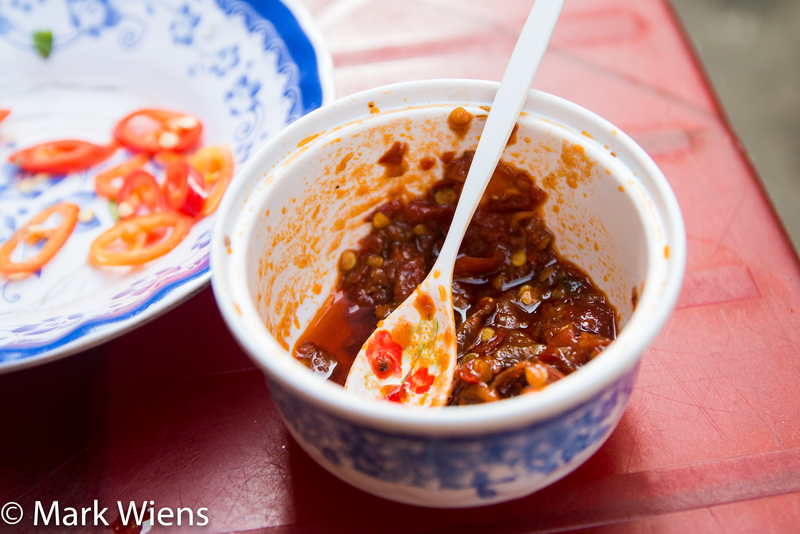 After tasting, I proceeded to toss in a few spoons of a sour tasting chili sauce that was sitting on our table and begging to be used, plus some of the sliced Vietnamese chilis (often found a noodle restaurants) to my bowl. But it was all about those crispy shallots and black pepper! The pork was extremely tender, and even on the big hunk of bone that was included in my bowl, the meat clinging to it just slid off. As I continued slurping and eating, I added more and more blanched vegetables which included fine shredded vegetables like water morning glory, bean sprouts, banana flower, and basil. Bun moc is Vietnamese noodle dish, typically made with a pork broth flavored with shiitake mushrooms, crispy shallots, and pepper. 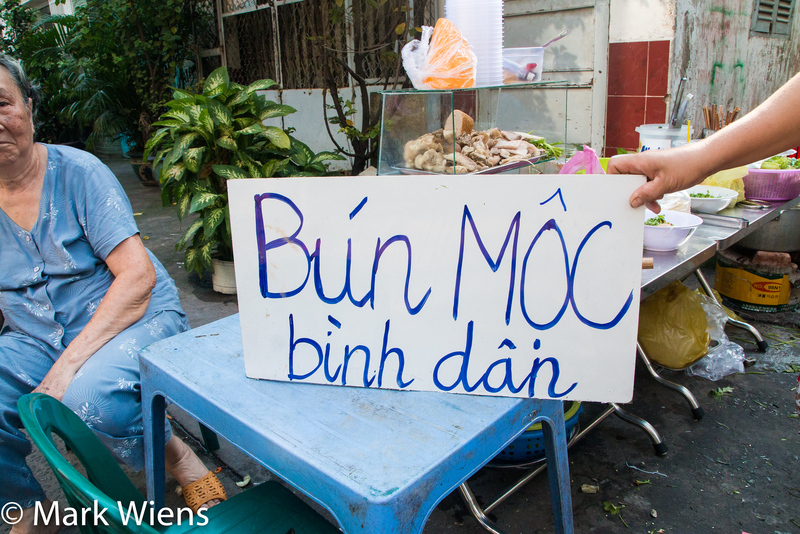 When I was in Saigon, heading back to our hotel, we took a wrong turn down an alley, and ended up sitting down with a friendly lady in the alley who was serving bowls of piping hot bun moc for breakfast. 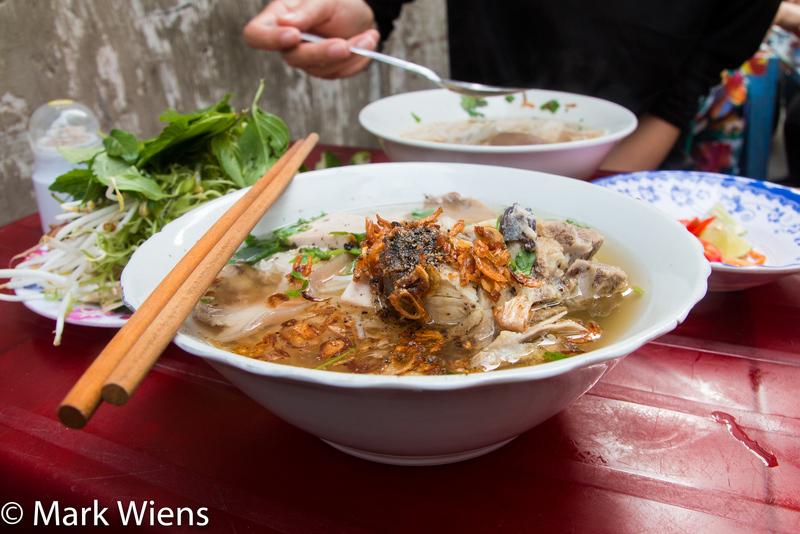 We pulled up a stool, and slurped down a bowl of bun moc, enjoying the atmosphere of the beautiful food filled alleys of Saigon. To me, bun moc is not the most flavorful Vietnamese noodle dish, but it’s pretty soothing and I think it made a fantastic breakfast. Note: This bun moc stall was down a random alley and it’s not really worth coming to this exact stall just to eat bun moc. 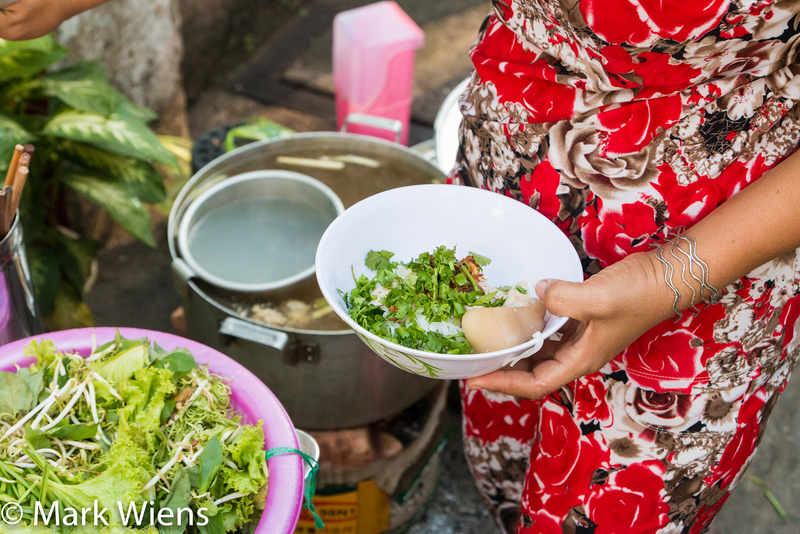 However, if you explore Saigon, you’ll stumble into hundreds of near identical Vietnamese street food stalls in alleys with friendly vendors. Enjoy! 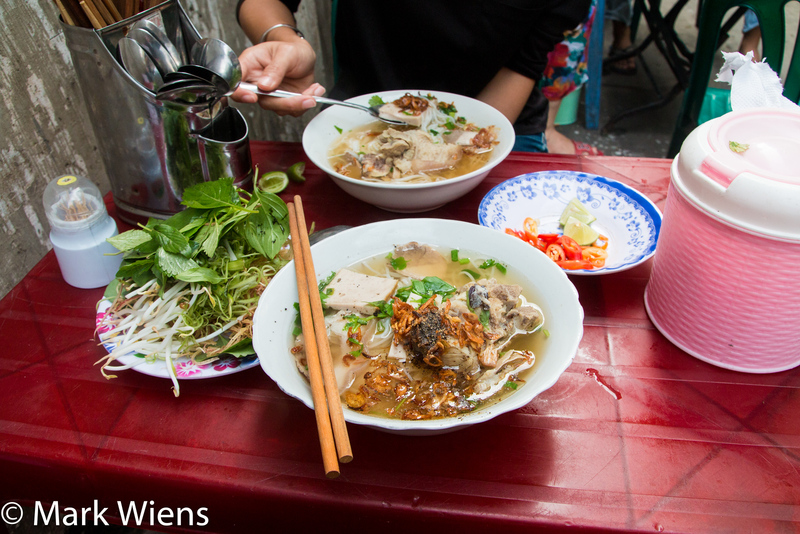 I love Saigon and her food – thank you for reviving the memories. Can’t wait to get back. 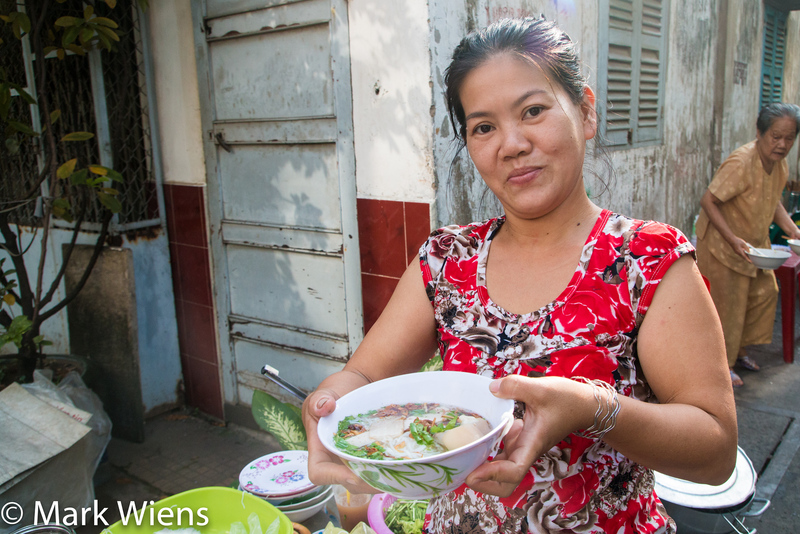 Thank you very much Ann, glad you enjoy the food in Saigon! This is the first dish I take my friends from out of town to eat. Forget about Pho, bun moc is my comfort food. I usually add quite a bit of fermented fish paste for a little kick of umami. Hey Nguyen, thank you very much, I would love to try more Vietnamese dishes. Hope you’re doing well in Japan! Hi Mark! 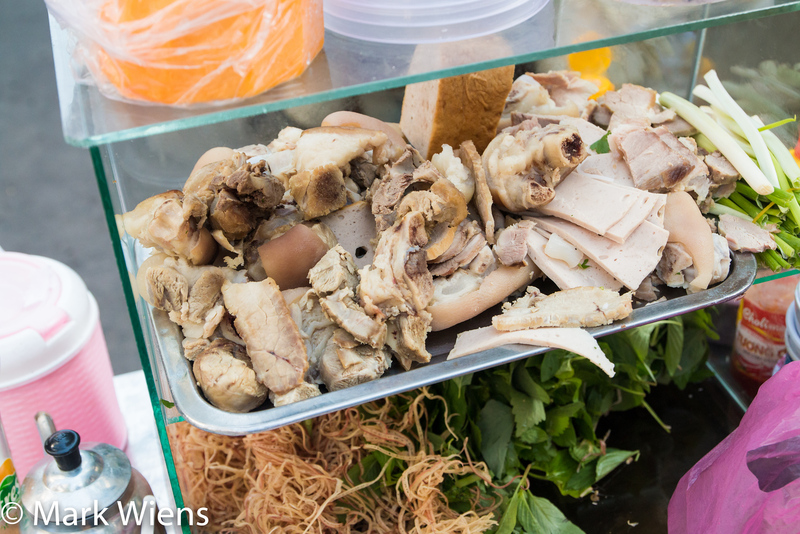 If you really want to try amazing Vietnamese food, I’d suggest traveling to the Floating Market in the Mekong Delta! Gordon Ramsay tried the Bun Rieu there and said that it was the best thing he has ever ate! Hey Linh, thank you very much, that’s sounds amazing. Next time I visit Vietnam, I will definitely try to go there. 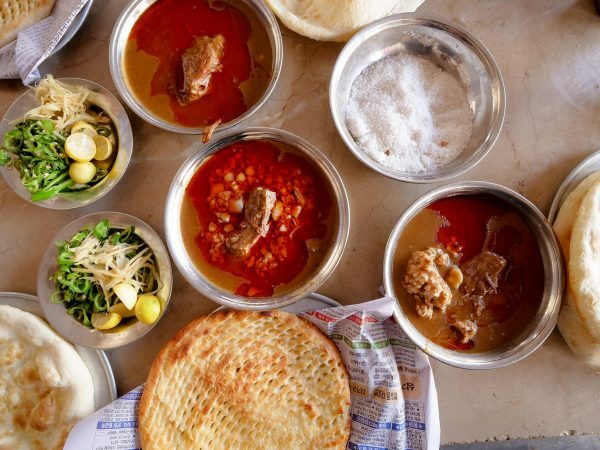 This looks delicious- good thing you stumbled upon it randomly! I do have a question though. 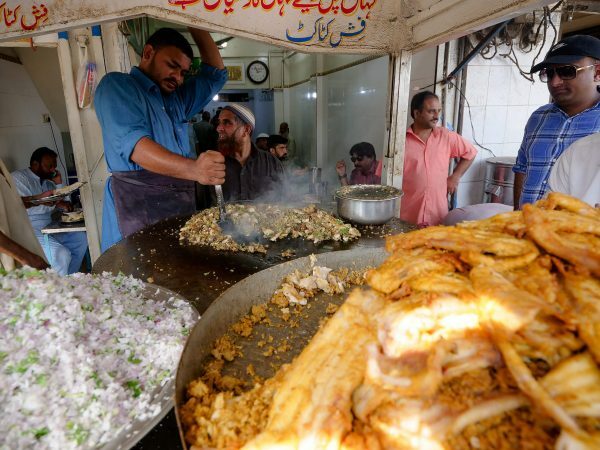 Are you ever worried that you might get food poisoning from food you get on the street like that? 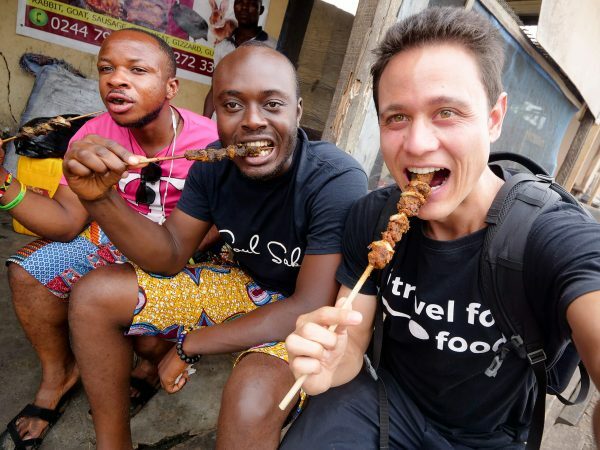 That is something that worries me when I travel and I’d love to know your opinion. 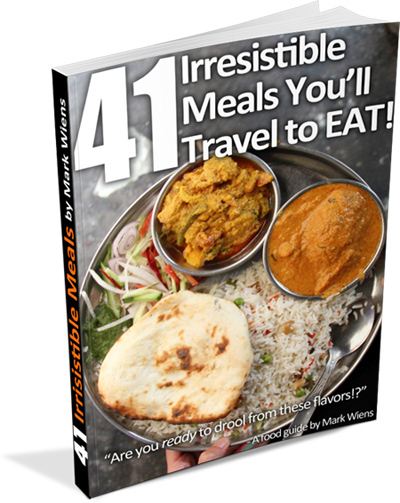 All of these great quality pictures PLUS the detailed descriptions of everything, totally just made us so hungry!! Bun moc sounds absolutely delicious. Thank you very much Nick, really appreciate it! Thank you very much for reading Jo Ann.